Thank you for joining us in Renton for our Equity Focused Positive Behavior Support Institute. We loved seeing so much engagement from early learning professionals around social emotional development and equity, and are grateful for all the session leaders and keynotes who came to share their expertise. Below, you will find summaries of each of the session tracks, as well as helpful tools and resources to put into practice. Dr. Strain is the Kennedy Endowed Chair in Urban Education at the University of Denver and director of the Positive Early Learning Experiences Center. He is the author of more than 300 professional papers in the early intervention field, has served on the editorial boards of more than 20 professional journals, has been the principal investigator of grants totaling more than $50 million, and has been recognized with distinguished career awards on three separate occasions. Dr. Durán is an expert in bilingual learning and education and dual language learners. At the University of Oregon, she is an associate professor in the College of Education. Lillian studies how to best serve young bilingual children in early education programs. Her research explores the impact on young children of English-only educational policies, the developmental impacts on young children whose families are experiencing high levels of stress because of immigration status and fear of deportation, and how to best support young bilingual preschoolers in programs such as Head Start. Lillian developed a Spanish early language and literacy screening tool that can be used to identify children in need of more targeted instruction. Dr. Fisher is the Philip H. Knight Chair and Professor of Psychology at the University of Oregon. His research focuses on developing and evaluating early childhood interventions in socially and economically marginalized communities, and on translating scientific knowledge regarding healthy development under conditions of adversity for use in social policy and programs. His lab is currently focusing primarily on studies involving the Filming Interactions to Nurture Development (FIND) video coaching intervention that he developed with colleagues. Dr. Fisher is particularly interested in the effects of early stressful experiences on children’s neurobiological and psychological development, and in prevention and treatment programs for improving maltreated children’s functioning in areas such as caregiver attachment, peer relations, and school. He is also interested in the brain’s plasticity in the context of therapeutic interventions. Dr. Fisher is the director of the UO Center for Translational Neuroscience. His laboratory, the Stress Neurobiology and Prevention (SNAP) lab, includes graduate students, post- doctoral fellows, and other researchers with similar interests. Dr. Fisher also directs the Translational Science Initiative and is the Science Director for the National Forum on Early Childhood Policy and Programs, both based at Harvard University’s Center on the Developing Child. He is Co-Principal Investigator on the NIDA-funded Translational Drug Abuse Prevention (TDAP) Center, working to increase understanding of the effects of early adversity and risk in decision-making and behavior on policy and practice in child welfare systems. Recipient of the 2012 Society for Prevention Research Translational Science Award, Dr. Fisher obtained his Ph.D. from the University of Oregon in 1993. A moderated panel discussion with families of children who have behavioral or learning differences, and are participating in early learning and care environments. Hear firsthand from family members and caregivers regarding their experiences in these settings, the impact on families, and their thoughts on the importance of having teachers and care providers who are knowledgeable and committed to using strategies to support social-emotional learning and address challenging behaviors in a proactive way. Jordan Taitingfong is an early learning training specialist at the Haring Center at the University of Washington. She has worked in early childhood education for over 15 years, as an educator and as a trainer, helping current and future professionals learn and use strategies to support the development and implementation of inclusive and equitable educational settings. Jordan earned her master’s degree in special education from the University of Washington, and is now pursuing her doctoral degree at the University of Washington College of Education. Learn strategies to promote social-emotional development and build secure relationships. Gain understanding about infant and toddler communication and the relationship between behavior and communication. Learn how environments can strengthen social-emotional skills. Develop understanding about the importance of observation in determining the meaning of behavior. Learn how to respond to behaviors of concern and develop a plan of support in partnership with families. Increase awareness about the role of implicit bias in positive behavior support and the preschool to prison timeline. Identify teacher and child interactions that are emotionally supportive. Identify and describe classroom management skills that prevent challenging behavior and increase active engagement in early learning. Learn evidence-based social-emotional instructional strategies for young children. Describe how a practice-based coaching cycle supports equitable behavior support. Reframe common early childhood behaviors into teachable and coachable moments. Use data to open reflective feedback conversations about equity in behavior support. Describe an evidence-based framework for addressing social-emotional development and challenging behavior. Identify strategies to address common challenges to evidence-based practices. Identify effective leadership strategies including collaborative planning and professional development. Apply collaborative, action-planning strategies for improving children’s social-emotional and behavioral outcomes. Families play an important part in their child’s education and social development, which makes the link between families and positive behavioral interventions and supports critical. This strand highlights the importance of family- centered practices and offers strategies to support parents in promoting their children’s social emotional development and reducing challenging behaviors. The sessions are designed for families as well as professionals who work with families. Forests, neighborhood parks, and play yards are complex and sensory-rich environments ripe for experiential learning and play. Early learning professionals walked through the woods and saw demonstrations on how to foster children’s wonder, excitement, and curiosity. Browse more of our institutes! Want learn more about what we do or want to join in on the educational fun? 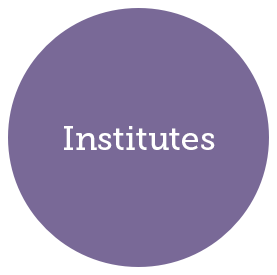 Visit our institutes page to find out what our institutes are about, register for institutes near you, view past institutes, and download resources on institutes topics.